March 5; PILDAT offer`s heartiest felicitations to Ms. Qurat ul Ain Marri, an esteemed member of first batch of PILDAT Youth Parliament, on her election to the Senate of Pakistan. 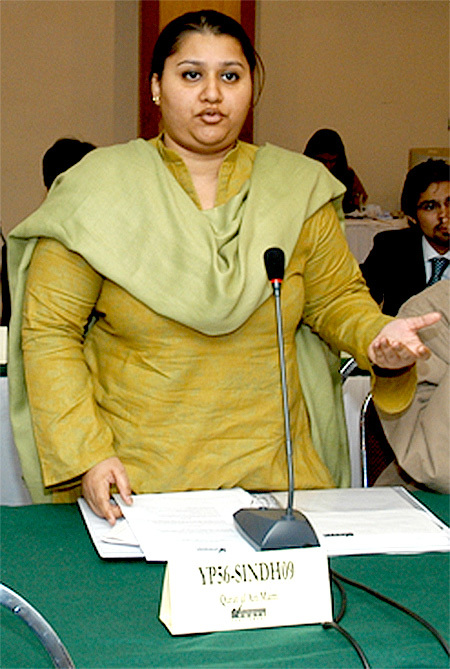 Ms. Qurat ul Ain Marri ( http://yp2007.youthparliament.pk/memprofiles6.asp ) was selected and served as the member of the very first batch of PILDAT Youth Parliament Pakistan in 2007. As an esteemed member of Youth Parliament Pakistan, she is the first Member of Youth Parliament Pakistan to be elected to Parliament of Pakistan. That is indeed a unique honour that celebrates the leadership potential of Pakistan’s youth. Launched in 2007, the Youth Parliament has successfully concluded 8 terms so far. (in 2007, 2008-2009, 2010, 2012, 2013, 2014 – 2015 and 2016). PILDAT serves as the Secretariat of Youth Parliament Pakistan. The Youth Parliament Pakistan has its own 2- party system, Leader of the House and Opposition, as well as an augmented system of Parliamentary Committees with Committee Chairpersons. The establishment and facilitation of the YPP is part of PILDAT’s focus on the country’s youth demographic and it’s awareness, education and training in the norms of politics and democracy. 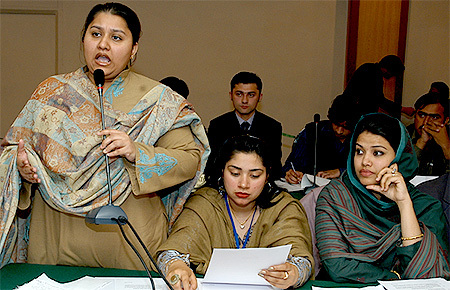 The first-ever Youth Parliament Pakistan, to whichSenator-elect Qurat ul Ain Marri belonged, was established in 2007 for a one-year term and proved as a great platform through which a representative section of the Youth of Pakistan practiced and experienced life under a political and Parliamentary spotlight. The young members of Youth Parliament Pakistan chose political association, elected their Youth Prime Minister and Leader of the Opposition, a Youth Cabinet and a Shadow Cabinet, debated public policy issues, worked in Parliamentary Committees and gave their detailed input to some of they key policies of the Government of Pakistan such as the Draft Youth Policy, proposed legislation on Provincial Autonomy and a host of other issues. The young members, drawn from across a cross-section of socio-political and economic spectrum of Pakistan, learnt and practiced how to prepare and move legislation, how to enlist support of their fellow members on their bills and resolutions in the House and how to reach consensus and compromise through the use of conversation, dialogue and understanding of the others’ concerns, views and perspectives. While Senator-elect Quratul Ain Marri is one of the first members out of the 850 young people from across the country who have been directly trained as members of Youth Parliament Pakistan, members of the Youth Parliament have served in the team of the Prime Minister of Pakistan Syed Yusuf Raza Gilani, a few bright Members serve on the Punjab Chief Minister’s team, in the Parliament Secretariat and with individual MPs or Ministries; some are serving in the Foreign Service of Pakistan, Police, Audit and Accounts, etc. after successfully qualifying in the CSS competitive examinations; many got selected for competitive scholarships and have returned after studying at the reputed international campuses such as the Cambridge University, UK, the Columbia University, the Harvard University, the New York University, and the Stanford University, USA, etc. ; some apply their learning in fields as diverse as television, agriculture, law, banking, medicine and engineering; some have joined teaching faculties such as the International Islamic University, or a local college in districts such as Gujranwala and some believe Youth Parliament experience helped them in even landing a job such as at the Rescue 1122 in the Southern Punjab. The list goes on. PILDAT team joins the proud Youth Parliament Alumni Association in wishing Senator-elect Ms. Qurat ul Ain Marri the best in discharging her responsibilities in the Senate of Pakistan.